Calcium and magnesium are critical elements of bone strength and density. The use of calcium supplementation is recommended by the US National Institute for Health and other health care experts but not all supplements are created equal. 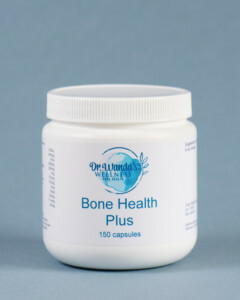 Dr. Wanda’s Wellness Bone Health Plus uses two superior forms of calcium and of magnesium to address absorption and bio-availability so your body gets and uses what you need without losing it through the digestive system. PLUS, we have added key “helpers” to improve absorption and bone formation like zinc, boron, manganese, and vitamins K2 and D3 so you can use that calcium and magnesium more effectively. Click here to read more about Dr. Wanda’s Bone Health PLUS formula! Want more of the research behind these supplements? Click here for Dr. Wanda’s Research Library about Bone Health Plus!